How to Maximize Chiller Efficiency? Home / Technical Articles / How to Maximize Chiller Efficiency? Chillers are the single largest energy-using component in most facilities, and can typically consume over 50% of the electrical usage. Chillers use approximately 20% of the total electrical power generated in North America and the U.S.
Department of Energy estimates that chillers expend up to 30% in additional energy through inefficiency. With over 100,000 chillers in the United States alone, inefficiency costs industry billions of dollars in energy annually. Chillers running inefficiently also result in decreased equipment reliability, increased maintenance intervals and shortened lifespan. 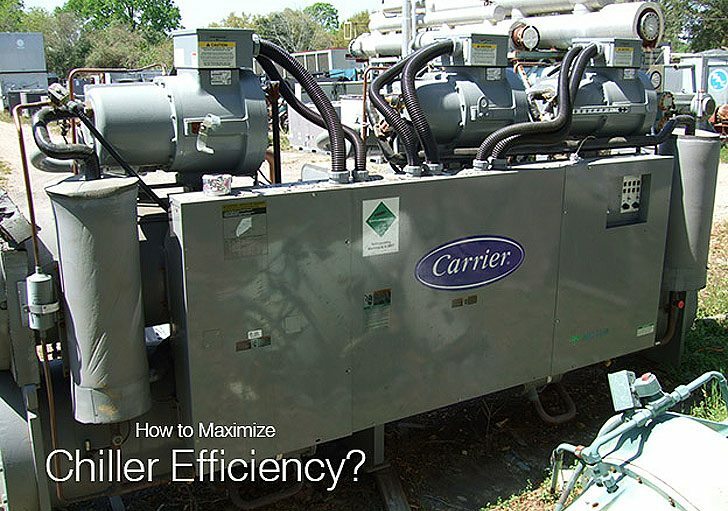 The slightest decrease in chiller performance can have a major impact on efficiency. For instance, every 1°F increase in condenser water temperature above full load design can decrease chiller efficiency by 1% to 2%. A failing or neglected water treatment program can reduce efficiency 10% to 35% or more in extreme cases. What is Maximum Chiller Efficiency? Contrary to popular belief, running the chiller at full load design and achieving the design kW/Ton does not necessarily mean the chiller is running at maximum efficiency. This is due to the fact that most chillers rarely operate at full load design (less than two percent of the time on average). Most chillers achieve the greatest tonnage at the lowest kilowatt usage by operating at approximately 70-75% load along with the lowest Entering Condenser Water Temperature (ECWT), based on design. Knowing a chiller’s efficiency and the effects of load and ECWT will help the facility determine the most efficient chiller configurations, saving the maximum on energy costs. The first step in maximizing chiller efficiency is to establish a method for recording chiller operational data in a daily log. It’s common for facilities to maintain chiller logs, but unfortunately they rarely get reviewed, which is critical. Collection and trend chiller operational data can be done automatically. Chiller performance at full and partial loads, calculates efficiency and diagnoses the causes of inefficiency can be accurately measured. Once the chiller status (baseline) has been determined, operational changes can be made to increase efficiency and measure the results. Ensuring accurate data can be difficult. One of the most common assumptions made by a facility is that the flow to the chiller is constant and always at design. Unfortunately, this may not be the case and there are several reasons why. Chiller systems are dynamic, ever-changing models, which must adapt to the environment around them. They expand and contract from the original design. They are subject to wear, tear and age. The best advice is don’t assume anything until proven by accurate, continuous verification. The best way to provide precise data, obtain concrete results and minimize problems is to verify flow rates to the chiller for tonnage measurements and other calculations to determine efficiency. Flow meters can be a high quality turbine type, magmeter (inline) or ultrasonic (external), and gives the most accurate Gallons Per Minute (GPM) flow readings. GPM can be determined by delta pressure using a gauge or annubar. Delta temperature cannot actually measure the flow rate in GPM, but it can identify proper flow and problems associated with flow. It can also be affected by other conditions not directly related to flow, such as a scaled or fouled chiller barrel, non-condensable gasses and refrigerant level, making interpretation more difficult. However, the use of delta temperature along with a flow meter or delta pressure gauge creates a powerful diagnostic tool that can detect problems affecting efficiency in the chiller system. Along with proper flow, check and calibrate temperature sensors/gauges, pressure sensors/gauges, electrical meters, etc. periodically or when a problem is detected. Increase the Chill Water Temperature and Lower the Entering Condenser Water Temperature For constant speed chillers, every 1°F increase in chill water temperature can increase chiller energy efficiency 1 to 2%. For variable speed chillers, every 1°F increase in chill water temperature can result in a 2 to 4% efficiency increase. However, it may not be possible to increase the chill water temperature to save money due to design constraints, occupant comfort levels or real-time energy pricing (sacrificing efficiency at one time to improve the efficiency at another time). Take advantage of wet bulb conditions in the cooling tower system to lower the chiller’s entering condenser water temperature. This can result in a 1 to 1.5% efficiency improvement for every 1°F below the chiller full load design. It is important to note that part loads associated with chiller type (high or low pressure) and compressor motor style (constant or variable speed) will affect the chiller’s performance. Consult the chiller manufacturer to establish appropriate guidelines for entering condenser water temperature. A good water treatment program is a necessity for efficiency. Maintaining the proper water treatment will prevent costly problems. If a problem(s) already exists, take the necessary steps to correct it immediately. The results can provide significant energy savings with greater chiller efficiency, maximized equipment life and reduced overall maintenance costs. Remember, always wear appropriate Personal Protective Equipment (PPE) when using chemicals or cleaning equipment. A water treatment program provides a biocide program that minimizes microbiological growth along with excellent scale/corrosion protection. Microbes, if not properly controlled, can cause numerous problems, such as forming sticky slime deposits in the tube bundle of a chiller, possibly reducing heat transfer efficiency 15% or more. The situation can be compounded by the formation of permanent scale or iron deposits on the sticky site. If this occurs, an additional 10 to 20% loss in heat transfer efficiency may result. To fix the problem and restore lost efficiency, an unscheduled shut down and physical cleaning of the chiller may be required. Furthermore, if no action is taken to improve the water treatment, under deposit corrosion may occur throughout the condenser system, which may create leaks in the transfer piping. Chiller System Dead LegCooling tower system cleaning is essential for peak efficiency. A good time to consider cleaning is fall and spring, just before and after winter lay-up. This usually means part or all of the condenser system may lay-up dormant for several months. Dead legs (no circulation/stagnate water) in the condenser system are potential areas for producing many types of microbes. One type of anaerobic bacteria of particular importance is Sulfate Reducing Bacteria (SRB). SRB can cause significant localized pitting corrosion and severe damage in a relativity short period of time. Treating these areas of a condenser system with biocides and biodispersants prior to lay-up can help minimize microbial problems. Lay-up treatments also ensure an easier start up in the spring, minimizing maintenance problems. Chiller Tower System Basin WaterA lay-up treatment is designed to protect the equipment and piping by reducing pipe chip scale (flash corrosion). This chip scale or flash corrosion can have a serious impact on start-up, causing blockage of distribution holes on the tower hot deck, plugged strainers and in extreme cases, blockage in the chiller. Any of these problems will reduce flow and heat transfer efficiency in the condenser system. When cleaning the tower basin, all debris should be removed (i.e. sand, silt, trash, and most importantly biofilm). Biofilms are home to many living organisms. Some, of the more common organisms include pseusdomonas slime, which can reduce heat transfer efficiency, and SRB. Tower cleaning should also include inspection of the drift eliminators, fill and louvers to minimize airflow restriction across the cooling tower system. Make sure the tower fans are working properly to produce the desired airflow for heat transfer removal. Chiller Tower System CorrosionVisually inspect the wood and metal construction, looking for signs of deterioration. Wood deterioration may be a sign of microbio problems (mold, yeast or fungi) or over feeding the oxidizing biocide causing wood delignification/deterioration. Look for white rust on the metal construction caused by either a tower that was never properly pretreated and passivated or a chemical program that may not fit the water chemistry. A thorough spring-cleaning can assist in maintaining maximum efficiency throughout the summer months. Pretreatment is recommended for a new system, (condenser, evaporator and tower system), or when there is a new add-on to an existing system to ensure heat transfer efficiency and prolong equipment life. The purpose of pretreatment is to remove oil and grease from new piping and chillers. If pretreatment is not performed, the oil and grease may adhere to the heat exchanger, reducing heat transfer. Oil and grease can also provide food for microbes to bloom, requiring additional costly biocide treatments. Pretreatment should passivate the new metals and minimize white rust and flash corrosion. Galvanic corrosion is associated with dissimilar metal coupling and can exist in all areas of the HVAC system (though it primarily occurs on the condenser side of a chiller), and if severe enough, can affect the life of the chiller. Metal passivating chemicals commonly used in the evaporator minimize galvanic corrosion. Most chillers have copper tubes with carbon steel tube sheets and end bells, in which a galvanic reaction can occur between the copper and carbon steel. Installing sacrificial anodes and painting the inside of the chiller end bells and tube sheet with an epoxy coating can also minimize this corrosion. Preserve Design Flow Rates Maintain condenser and evaporator design flow rates, checking them annually. A rule of thumb is to always maintain flow greater than 90% of design because lower flow will reduce chiller efficiency. When the flow is reduced or restricted, it can create undesirable laminar flow (less than 3 feet per second) through the chiller, which can also cause a water treatment program to fail. Above design flow (greater than 12 feet per second) through the chiller may cause vibration wear and erosion/corrosion of the tubes, reducing reliability and life. Cracks and pitting holes can develop causing leaks in the tube bundle. The ability of a chiller to efficiently remove heat directly correlates to the compressor’s ability to move the refrigerant per unit of time. It is important to maintain proper refrigerant levels because low levels cause the compressor to work harder and less efficiently. Check for leaks regularly, especially when a chiller shows signs of low refrigerant level. Trending refrigerant levels will help determine if the chiller has a leak(s), a bad purge unit or refrigerant carryover (i.e., due to low ECWT). Regular refrigerant analysis is an important part of determining chiller inefficiencies. If oil content in the refrigerant is above the chillers manufactures guidelines, it may be reducing heat transfer. Keeping good maintenance records on oil usage in a chiller will help to avoid this condition. Compressor oil analysis should be performed annually. Low-pressure chillers may require more frequent analysis, based on purge run hours. This test should include a spectrometric chemical analysis containing information on metals, moisture content, acids and other contaminants that can affect chiller performance. Replace oil filters on an as-needed basis including high pressure drop or when the compressor oil is changed. Consult your chiller manufacturer, lubricant supplier and/or oil analysis laboratory for oil and filter change intervals. I really like your tip to establish a data recording method. It can be hard to determine what is normal if you are not keeping track of how your chiller is performing. I like how doing this can help you identify and fix inefficiencies. How much data do you need to collect to establish a baseline? Thanks for all this great information!